If you like your opera – and your opera productions – challenging, steer clear of this! Written late in the composer’s life Béatrice et Bénédict has little of the revolutionary Berlioz about it; it comes as close to opera-comique as anything he wrote, a comfortable divertissement, though not without its oddities (which work by Berlioz is free of a certain degree of aesthetic perversity?). That Berlioz should, as his composing life came to an end and his health failed, have paid a final homage to Shakespeare was only fitting, given his life-long admiration of the dramatist. But in doing so he largely denatures the work he takes as his starting point. Much Ado About Nothing is tonally complex, exploring the interplay of love and self-love, through the malice of Don John and, in a sense, through the figures of Beatrice and Benedict themselves. Berlioz strips out Don John and his henchmen and thereby removes all the dramatic tension which derives from their plot to slander Hero. What he is left with, his title suggests, is a focus on the relationship of Béatrice and Bénédict themselves. But even this is denuded of such tension as it has in Shakespeare; Berlioz’s libretto makes it clear, much earlier and much more explicitly than Shakespeare’s play does, that the two need only some friendly interference to be brought to the altar. In truth Berlioz’s libretto is a rather disjointed affair which fails to fill in all the details, even of its rather limited plot (it sometimes seems to rely on an audience’s familiarity with Shakespeare) and in which each of the musical ‘numbers’ feels very isolated, the plot largely moved on by the dialogue. Elijah Moshinsky’s production (first performed as long ago as 1994) wraps the divertissement in luxurious gowns, and sets it on a nicely realised Italian Renaissance perspectival stage, which is beautifully lit – though it is a stage that is somewhat cramped (presumably because the set is that originally employed on the smaller stage of the New Theatre in Cardiff). This is frustrating when so much of the large stage of the Millennium Centre is left unused. Some of Berlioz’s other choices seem strange. In Shakespeare Hero says so little that scholars have exercised themselves at length over the problem of why this should be so. In Berlioz’s opera she gets plenty to say (and sing) for herself and it is Claudio who is effectively silenced. Even in the relationship now put centre-stage, as it were, by Berlioz things are somewhat lopsided. Bénédict gets surprisingly little opportunity to sing out, especially in Act Two; while Béatrice does have more vocal opportunities they, perversely, largely come in Act Two. The interplay between the two largely happens in speech rather than song. Yet … there is some lovely music to be heard! Famous moments such as the duet which closes Act I, the Nocturne sung by Hero and Ursula (‘Nuit paisible et sereine!’) – a piece which soon took on a life of its own divorced from the opera – remains, however many times one hears it, ravishingly beautiful and touching. The voices of Laura Mitchell and Anna Burford were beautifully blended and counterpointed here, the darkness of Anna Burford’s voice and the light clarity of Laura Mitchell’s working together to beautiful effect, a ravishing moment of stillness. Mitchell was also impressive in her spectacular aria earlier in Act I (‘Je vais le voir, je vais le voir’) where she handled the spectacular (and somewhat perverse?) cadenza with considerable aplomb. In the Act II Trio (‘Je vais d’un Coeur aimant’) in which Hero and Ursula are joined by Béatrice full justice was once more done to the beauty of Berlioz’s writing. Sara Fulgoni was in fine voice as Béatrice, especially impressive in ‘Dieu! Que viens-je de’entendre’, a piece in which one feels the shadow of another of Berlioz’s heroes Gluck. It is striking that so much of Berlioz’s best vocal writing in the opera, as so often throughout his career, is for women’s rather than men’s voices. The men in Béatrice et Bénedict get relatively little to get their teeth into, musically speaking. Claudio is essentially a speaking part, save for his contributions to the Act I trio (‘Me marier? Dieux me pardonne!’), so there was little chance to hear the promising baritone of Gary Griffiths; Don Pedro’s sung contributions are merely functional and were decently handled by Piotr Lampa (though his heavily accented English was mildly distracting in the Shakespearean dialogue). A pre-performance announcement told us that Robin Tritschler was suffering from a cold but there was little wrong with what he did, though his rather delicately lyrical tenor is perhaps not ideal for the mocking Bénédict of the opening. Bénédict, like Claudio and Don Pedro, is not a role endowed with any of Berlioz’s best writing. Unsurprisingly, the memorable male performance is that of Somarone (the drunken musician provided by Berlioz to replace the broad comedy lost with the omission of Dogberry and Verges). Not, of course, that Somarone has any great opportunities to show off his singing voice. But Donald Maxwell (who has gone a long way to making the part his own) brings some delightful physical comedy to the part and has some excellent gags (“Sopranos who can read music we call mezzos”). One wonders what Berlioz would have made of such comic expansion of his text? I suspect that like his hero Shakespeare (through the person of Hamlet) he would have enjoined “let those that play your clowns speak no more than is set down for them; for there be of them that will themselves laugh to set on some quantity of barren spectators to laugh too, though in mean time some necessary question of the play be then to be considered. That’s villainous and shows a most pitiful ambition in the fool that uses it”. But, in truth, Maxwell’s comic, but shrewd, characterisation of Somarone (a characterisation not without its pathos) gives a refreshing element of sheer theatricality to proceedings. 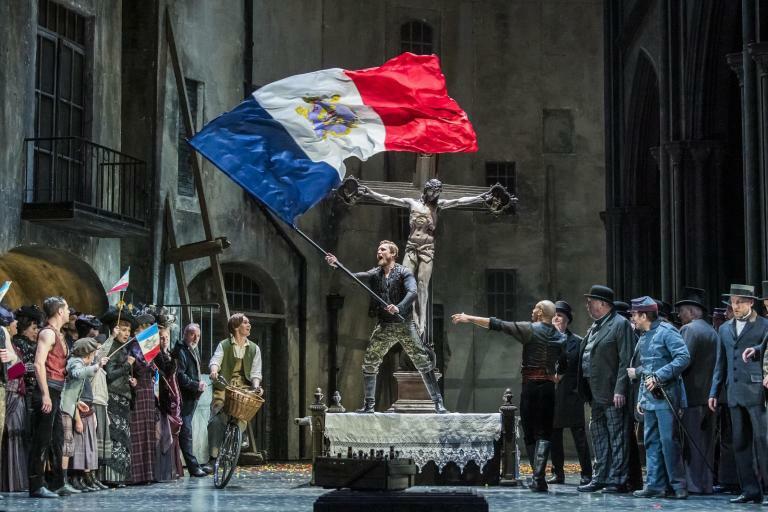 Elijah Moshinsky’s production does much to give Berlioz’s work a theatrical substance it doesn’t intrinsically possess and goes a long way towards succeeding, though the battle is finally an unequal one. Still, with some vibrant orchestral playing (the woodwinds were given the prominence the score surely requires them to have) and the lively, well-paced conducting of Michael Hofstetter (who found a rhythmic lightness in the score which not all conductors discover) and some solid singing there is much to take pleasure in. Best to just sit back and enjoy a work well described by Martin Cooper as “perverse but often delightful”.